You don't have to be a Nordic, Michelin-starred chef like Rene Redzepi to work wild-grown foods into your cooking. We can forage right here in Los Angeles County. Because of our summery winter, edible plants such as Lamb's Quarters, Miner's Lettuce, Nettles and Wood Sorrel, are flourishing now in our local canyons and mountains and maybe even in your own backyard. When foraging for greens there are a few things to keep in mind: be sure to pick plants that have not been sprayed with pesticide or that grow near a contaminated water source. (Think golf courses and road run-off!) Don't forage too often in the same location, as over-picking can deplete supply (Although many would argue that the aforementioned plants should be eradicated.) Respect the surroundings and don't forget wildlife (bunnies!) that might need to eat the greens too. Lastly, because neither this writer nor Squid Ink can be held responsible for poisoning-by-weed, consider foraging with an expert botanist or taking a class from local naturalist, Christopher Nyerges. Lamb's Quarters have a nutty, slightly floury flavor. The leaves are good in small doses when added to salads and the whole plant, including the stem, can be sautéed. Lamb's quarters can be foraged all over the city in fields, vacant lots, casually tended gardens and in parks. Miner's Lettuce looks like cute, miniature lily pads. The annual is wild and unique to the West. It grows as far north as Alaska and as far south as Central America, but is most abundant in California. Miners who flocked west during the gold rush ate the lettuce to ward off scurvy (it's a good source of vitamin C)--hence the moniker. You can find stands of the plant in shady, woody areas in spring and early summer. Once picked, the tender, mildly tart leaves should be eaten quickly. Wood sorrel is a common, prolific weed. This garden nuisance, aka Oxalis, has a complex root system, making it difficult to eradicate, and every year it multiplies. Gardeners hate this weed, but at least it can be eaten. Kid's who chew on the stalks call it sour grass, and it is sour. Wood sorrel's shamrock-shaped leaves and little yellow flowers make a pretty and lemony addition to salads and can be used as a garnish with fish. 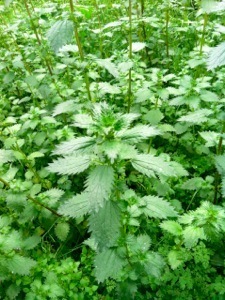 Nettles are often called Stinging Nettles because this stuff stings! If you have ever noticed an uncomfortable, insect-infestation-like discomfort around the ankles while hiking, chances are that you brushed by some of this edible plant. Nettles grow in the spring, mostly in areas where the rainfall is heavy- but there are huge stands in the San Gabriels even during this dry year. Wear gloves or use tongs to pick the leaves and soak them in cold water for at least an hour to remove the zinging chemicals. Creamy, fresh goat cheese mellows this leafy salad beautifully. California's La Tourangelle roasted walnut oil and fresh lemon juice enhance the grassy, tart and nutty flavors of the greens. 1. Soak the nettles in cold water for 1 hour. Drain and gently dry. 2. Whisks the oil, lemon juice and honey in a small bowl to blend for vinaigrette. 3.Combine the nettles with the miner's lettuce, lamb's quarters and wood sorrel leaves in a large bowl and sprinkle with sea salt. Toss the greens gently with enough vinaigrette to coat lightly. Divide the greens between plates and top with goat cheese. Garnish the salads with wood sorrel blossoms and cracked pepper.